Soniyo (From The Heart) (RAAZ-2), Main Jahaan Bhi Rahoon (Namastey London), Har Saans (Zindaa), Ishq Khudaai (Rudhraksh) , Rabba (Musafir), Deedar De (Dus), Aap Ki Kashish (Aashiq Banaayaa Aapne), Aa Dil Se Dil Milaa Le (Naqaab), Maula Mere (Chak De! India), Jaane Ke Jaane Naa (Jaan-e-Mann), Jogi (RuBaRu)…these are just some of the many beautiful songs Krishna Beura has lent his soulful voice to. Today, I, Amanda Sodhi, present you with another in-depth interview, this time with the very talented singer and music composer Krishna Beura. Read away and enjoy this candid interview in which Krishna talks about his move from Dubai to Bombay, how he got his break, his goals, his experiences at concerts, changes he would like to see taking place in the music industry, his latest album and much, much more! You studied theatre at Panjab University in Chandigarh. Later, you ended up moving to Dubai to work as a RJ. How did you decide to make the transition to becoming a singer? Having a degree in theatre, do you also want to get into acting? Well, I went to Dubai for singing in Four Points Sheraton Hotel's Indian restaurant Maharaja. In the daytime, I used to be free, so I once walked into the radio station, Radio Um-Al-Quwain, which later became 106.2 HUM FM, one fine morning and asked them to keep me. Mr Shahid Jamal, the proprietor, took my interview and he loved my talent and I never looked back. I worked with them for almost 3 years. In fact I always wanted to be a pilot in the Indian Air Force, and serve my country. My father is a retired Air Force personnel. But, the day I heard Nusrat Fateh Ali Khan Sahab, this transition happened. Wow! Looks like Nusrat Fateh Ali Khan’s music has had a profound effect on you. What’s your favorite composition of his? Well Nusrat Sahab's all compositions were out of the world, but the day I heard the song Saanware and all the other songs of Shekhar Kapoor's Bandit Queen, my life changed. I strongly felt that I will now devote all my life in becoming a singer. The other songs which I like are Khanjar Hain Teri Aankhen, Sannu Ik Pal Chain Na Aawe, Saanson Ki Maala, Nit Khair Manga, etc. After returning to Mumbai from Dubai, you did voiceovers, transcriptions and scripting for DreamWorks and Walt Disney's animation series. Tell us a bit about this experience. Well, when I came to Mumbai, I had a notion that I would get a break very easily. But, this never happened. The music directors never had time for me like for other newcomers. Then, I met Mrs. Leela Ghosh who is an owner of a company called Sound & Vision. They work for all these American companies. I got a lot of work from them for dubbings and transcriptions. This was a new work for me, which gave me decent easy money for my bread and butter in Mumbai. Rather, Pao and Bhaaji. Although, working in theatre gave me the idea of doing this work in a good manner. I always had the talent of doing mimicry from my childhood. It all started by imitating my teachers, friends, relatives and actors. So, it was easier. It is said that instead of going to music directors, you went straight to Sanjay Dutt with a CD of Nusrat Fateh Ali Khan’s songs in your voice? Well, as said earlier, the music directors never had time for me. I came to know from someone that Sanju sir is a great fan on Nusrat Sahab. I decided to meet him. Then I recorded some cover versions of Nusrat Sahab's songs and took a CD for Sanju sir. I thought he would never have time to listen to it and might lose it as well. But, to my surprise, I got a call from Vishal and Shekar to meet Sanjay Gupta record for Musafir. The director Sanjay Gupta told me that "Sanju ko teri aawaz bahut pasand aai hai." He wants you to sing for Musafir. Then, after two days I got a call from Kaleem Khan, Sanjay Dutt's manager, to come and meet Sanju sir. I met him and we had an hour long meeting. Immediately it came to my surprise that I will be singing for four films: Rudraksh, Musafir, Rakht and Deewaar. Sanju sir is the sweetest person I've ever met in the industry. He has got a bigger heart than the Earth. He is my Godfather and he helped me to walk when I was learning how to walk in the industry. He is one of the most special persons in my life. I will always regard and love him for what he has done for me. I always pray to God, "Hey Bhagwan hamesha mujh se zyaadaa khushi Sanju sir ko denaa." Even though you have an amazing voice, we only get to hear a few songs of yours each year. Why is this so? Are you extremely selective with the assignments you choose? No. Who am I to decide or select assignments or songs? I sing almost all the songs that come my way. In Bollywood, luck and PR are more important than anyone's talent these days. I am looking for a good PR right now. May be my time is yet to come, and it will surely come. From Ishq Khudaai, Rabba, Har Saans, Aap Ki Kashish and Main Jahaan Rahoon to Risk, Insha Allah, Maula Mere, Jogi and Soniyo, I personally think all of your songs are wonderful. However, if you had to pick one song as your overall favorite, which one would it be? All the songs are my babies. I love them all equally and I thank all the producers, actors and music directors for choosing me for their songs. But, I really loved singing Maula Mere from Chak De! It was a divine experience. Salim-Suleiman composed it brilliantly. Salim Bhaai recommended my name to Mr. Aditya Chopra and Yashraj Films. A brilliantly written song by Jaideep Sahani. And I was dying to sing for one of my favorite actors, Mr. Shah Rukh Khan, which came true with this song, thanks to everyone! Tell us a little bit about your observations of the approach to music of the various music directors and singers you've worked with? India is one of the most brilliant countries in the world where there is a mixture of different cultures and religions. This gives Indian music composers and singers the versatility of doing their work with perfection and ease. All the composers and singers I have worked with are brilliant in their own way. They are very, very professional and they know what they are doing. Now the new generation has a good exposure to world music. So, they can create or render almost any kind of song. Apart from the legends, my favorite singers of new generation are Sonu Nigam, Abhijeet Bhattacharya, Udit Narayan, KK, Jaspinder Narula, Richa Sharma, Sunidhi Chauhan and Shreya Ghoshal. I have worked with Ilayaraja, Shankar-Ehsaan-Loy, Aadesh Shrivastava, Vishal-Shekhar, Salim-Suleiman, Anu Malik, Himesh Reshammiya, Raju Singh, Anand Raaj Anand and Pritam. All are talented and brilliant in their own ways. Are there any singers and music directors in particular you would like to work with? Is their any actor in particular you would like to sing for? I would love to sing with Lata Ji and Asha Ji. I have already sung with contemporaries like Sonu Nigam, Sunidhi Chauhan, Richa Sharma, etc. I would have loved to sing with Nusrat Sahab, but am happy to have sung with Rahat Fateh Ali Khan in Namastey London (Main Jahan Rahoon) . 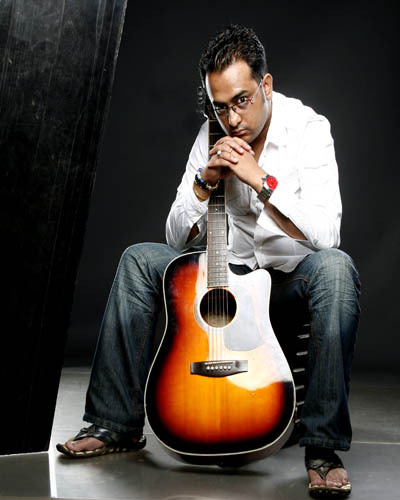 I have worked with almost all the music directors in Bollywood as I mentioned, but I am waiting for a call from Mr. A.R. Rahman. It will be the biggest break of my life and I am sure after "Maula Mere Le Le Meri Jaan" from Chak De! , it will be a milestone song for me. I think singing for Mr. Rahman is just like a pilgrimage. Means if one does not do it, his life as a singer is a waste. It’s like jiwe Panjabi wich kehnde san "Jinne Lahore nahi wekheya oh jammeya nai." Which actor do you think is best suited for your voice? I will be lucky if I sing for all of them, though I have sung for big actors like Amitabh Bachchan, Sanjay Dutt, Shah Rukh Khan, Anil Kapoor, Akshay Kumar, Emraan Hashmi and Akshaye Khanna. Recently, I have sung Soniyo for Emraan Hashmi, Adhyayan Suman and Banda Re filmed on Jaackie Shroff for the film RAAZ-2. But all the songs were situational and in the background. But, I think I can sing for any actor, provided the music directors trust in my mimicking qualities and compose songs accordingly. My only songs which were lip synced by actors are Aap Ki Kashish by Emraan Hashmi in Aashiq Banaya Aapne, Insha Allah by Feroz Khan, Akshay Kumar and Nana Patekar in Welcome, Mere Saath Chalte Chalte by Anil Kapoor in Humko Deewana Kar Gaye, and Aa Dil Se Dil Mila by Akshay Khanna in Naqaab. What is some of the positive and negative feedback you have received so far? The biggest compliment I have ever got for my singing is by a TV Journalist Abhisar Sharma from Aaj Tak, after he saw Chak De! India he said, "Krishna Aaj Tak logon ko aankhon se rote hue dekha hai, par pehli baar koi gale se roya hai boss. Kamal hai janaab, you are awesome." Biggest criticism is about to come in the coming years, though some ignorant people suggest me to sing in my own voice, "Krishna apni aawaz mein gaya karo." I don't think I ever borrowed my voice from someone, neither my vocal chords were transplanted. I wish I could sing in all the singer's voices, I would have earned a lot of money. But, yes I have always worshipped Nusrat Sahab and my style is very much from the same school of singing. I will keep on singing in the same style. I am sure when I become a superstar, they all will agree with me "Newcomers ko sab boltey hain." Tell us a bit about your experience with doing concerts. Is there any place in particular where you enjoyed performing the most? Yes, I love doing concerts and in my concerts I feel like touching my audience's hands. I do it wherever I can. After all, they are my "Bhagwan." I want to feel them and confirm if I am not dreaming and this love and affection is real and true. I have performed all over India and various countries in the world. But, I have loved performing in Ukraine (Kiev), Poland (Warsaw), USA and Canada. I love to do concerts with musicians on board not with minus tracks. I can perform for three, four hours nonstop. Are there any changes you would like to see taking place in the music industry? Yes, I would love to have a lot of changes. Some are, they should start recording live like they use to do earlier. I am sure it will be great. The bonding between singers and musicians will become very, very strong and it will help the musicians to earn good money as well like the singers. We have multi-talented artists in India. Bollywood should utilize artists from our own country rather than importing singers and musicians from abroad and promoting them at the cost of our own artists. I don't mind it if it is the same both ways, though. I know I am sounding harsh, but that is how it should be. This is just my personal opinion. So, if your idol, Ustaad Nusrat Fateh Ali Khan were still in this world and living in Pakistan, would you still feel the same way that Bollywood should use an Indian singer instead of him? I Know art has no boundary, and I never said this about the legends like Nusrat Sahab, Ghulam Ali Sahab, Mehdi Hassan Sahab or Abida Ji. They are all sensible artists and are not ehsaan faramosh like some other newcomers who became famous in India or internationally by doing work in India and then give comments about Indians and Bollywood ''not knowing how to make Music'' or ''Indians are copycats'' or ''Indians don't know much about Sufi music.” They should be thankful to Bollywood for making them stars, before they came to Bollywood now one knew if they existed. But, yes, I like Faisal and Bilaal of Strings also for being neutral and nice apart from the good music they do. They love and regard Bollywood. It really hurts when someone comments about my India or Bollywood. If I do the same with any other country, ehsaan farmoshi, then do you think people will call me a sensible artist? There are so many people who wish to become a singer! What are some mistakes you see struggling singers making? Do you have any advice for them? Do you see any benefit of reality shows? Bollywood is a happening place and lot of singers come here with the ambition of making it big. But one should first be very sure about his or her talent and should not come here at the stake of their studies and qualifications. After all, they can go back and find a decent job if they fail. Reality shows are a good medium to earn money for singers but they should not leave their exams and studies in order to come and shoot for it. Winning them will not get them enough work in Bollywood. It’s their talent which will take them places. Winning a reality show by people's SMS'es will not serve the purpose. One has to be really talented to sustain. What do you think makes a good singer? How important do you think vocal range is for a singer to be able to survive in the industry? Or, do you think it is the quality of the voice/timbre which matters more than vocal range? Yes, vocal range and versatility is very much needed with good singing skills—classical base, Indian and Western both—to get a break and then survive in Bollywood. One has to match an actor or actress, that is where the timbre plays a major role. One has to sing with a feel of the situation in the film as well. One can not sing a sad song with a happy feeling or the opposite or just sing all the songs with a flat feel. All these qualities make a good singer--this has been the quality of all the legendary singers, this is what I think is very important. But yes! These days a good PR and controversies can easily make one famous and rich without any talent at all. So many singers come and go in the industry. Why do you think very talented singers end up disappearing suddenly? My last answer reveals a lot about this question as well, but one also has to be a good human being to survive in the industry. Ego and bad attitude will be of no help or has never been to anyone in Bollywood. "Bahut aaye bahut gaye." People with due course of time after becoming stars tend to forget this and then they are out because no one should think that no one can replace them. Be nice and loyal to people who give you work. Remember, "don't mis-behave with people when you are going up because you will meet them while coming down." This is what I practice myself apart from being talented. My album Ishq Gali Na Jaiyo has already released. It has got eight songs. I have composed five songs myself. Two songs are by Prakash-Ashish and one is by Sachin Gupta. Some lyrics are by the legendary Faaiz Anwar of Sonu Nigam's Deewana fame. Some are by Rohit Sharma and Shellee, both newcomers. Most of the songs are Sufi numbers and some are folk and one is a club track. The title track is a pure Sufi number, my tribute to my Guru Nusrat Fateh Ali Khan Sahab. The audio is available on TIPS. I compose for friends only. I am very happy with how my career as a singer has shaped up, though still I have to go a long way. But, yes, I have composed and sung three songs for a film called Jugaad which stars Manoj Bajpai, Hirshita Bhatt, Vijay Raz, Nitin Arora and Sanjay Mishra. The producer Sandiip Kapur requested me to make some songs as he liked my work a lot. My song of this film Tu Hai Rab Mera is a Sufi feel track which is liked by the media and people a lot. I have also composed 15 songs including the title track for a daily soap "Meet Mila De Rabba" on Sony Entertainment Television India. As of now I have loved working as a music composer. Will keep on doing it for my friends, but not right now as a profession. I have always listened to Nusrat Sahab and will keep on doing that all my life. But, yes I listen to new songs on FM in my car while driving, just to know about the current scenario of Bollywood. Please tell us a bit about your upcoming projects? I have already sung for about 30-35 films until now which are about to release. The most recent to be released, which I am eagerly waiting for is a film Acid Factory by Sanjay Gupta, Blue Oranges, Let's Dance, Visar, etc. Is there anything else you would like to tell our PlanetBollywood.com readers? Please keep on loving and supporting my songs in the future as you guys have done ‘till date. Please pray for my success. I will promise, I will always sing quality songs and never let you down.